The theatrical release poster for the movie appears to have been taken at Hanalei Beach. Photos included today are not ours. We've made an effort in every country in which we've lived to watch a movie that was either made in that country or depicts the country in rich detail. Last night, we watched the Descendants, the 2011 Golden Globe winner for Best Picture and Best Actor Drama for George Clooney and also an Academy Award winner for Best Adapted Screenplay. 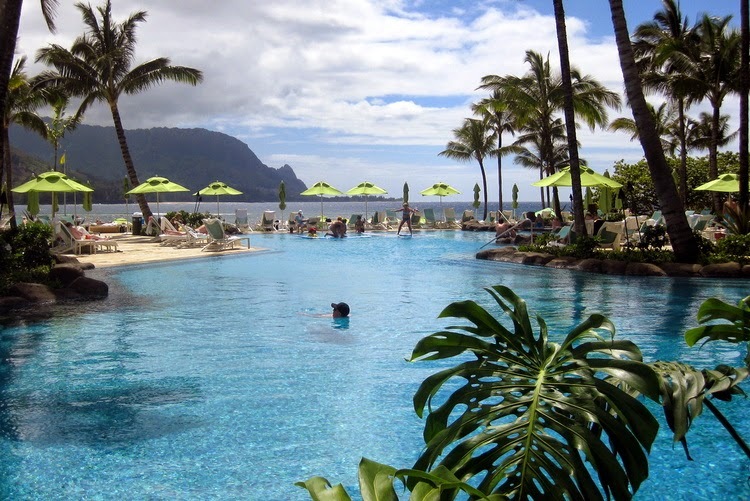 The pool at the St. Regis Hotel as shown in the movie. When we saw this scene, I thought it might have been Princeville Ranch. Tom felt is wasn't. 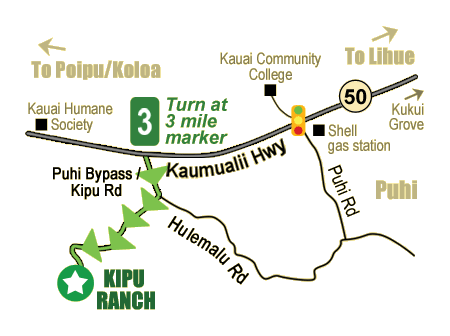 Once again he was correct when we checked at this website that contains various scenes in the movie to we discovered it was at Kipu Ranch, a 3000 acre cattle ranch in southern Kauai, a location used for many movies. I won't share the story line here to avoid creating a spoiler alert. If you haven't seen it, its worth watching even if you've never been to Hawaii. The scenery was breathtaking especially at the beach and pier in Hanalei, my favorite spot on the island of Kauai. We would have watched this movie sooner had I not assumed we'd already seen it. But, as we began winding down time in Kauai, I finally looked it up to discover that we hadn't seen it and it was time to do so with only five days remaining in Kauai. The map of the location of the ranch scenes in the movie. The book was written by author Kaui Hart Hemming, a long time resident of Hawaii. She had a cameo appearance in the movie as Matt King's (George Clooney's role) assistant. Its not a true story although a story line one could easily imagine that would be appropriate in Hawaii. The movie was interesting and held our attention. Clooney played his usual believable character with passion, skill and vulnerability as was also the case with the remaining cast. If you currently have or have previously teenage kids living with you, you'll easily appreciate the humor and challenges of this period in young people's lives not only for themselves but, also for the parents. "When The Descendants’ co-producer George Parra says “Every location [used in the movie] is the real place,” he wasn’t kidding. For example, pick the bar that Matt King’s Cousin Hugh (Beau Bridges) hangs out in. 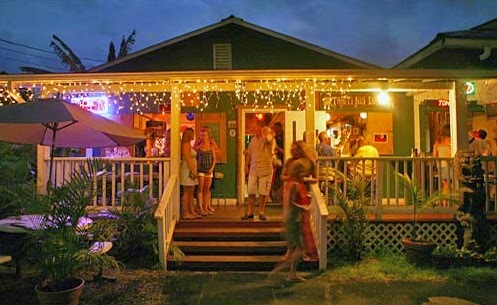 It’s a real-life Hanalei bar called Tahiti Nui, a favorite local hang-out." We particularly enjoyed the movie when we spotted familiar scenes, for example, at the St. Regis Hotel, which we've often visited when wandering down the road for photos on our many walks in the area. Also, there were several scenes in downtown Hanalei, the sleepy little tourist town we've often visited when dining out resulting in considerable photos ops. When we were living in Tuscany, Italy we decided to start watching movies depicting the areas in which we're living at the time, such as in; Tuscany in summer of 2013 when we watched "Under the Tuscan Sun" and then, in Kenya, in the fall of 2013, when we watched "Out of Africa" and, a year ago, when we watched, "Casablanca" while living in Morocco. 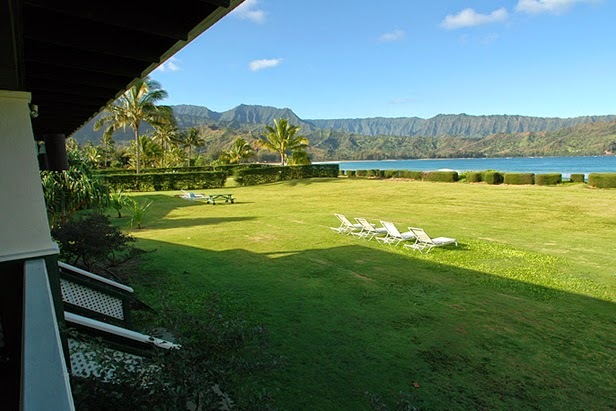 The expansive lawn of a cottage located on Hanalei Bay used in the making of the movie. We haven't always been meticulous in watching movies with scenery and /or story lines of countries we visit. In the future, we plan to be more diligent in doing so sharing photos and comments here. Do you have a suggestion of a movie filmed in Australia, particularly near Cairns or Trinity Beach, located in the Queensland area? Have a happy Monday filled with hope for the future as well as the ability to live in the moment. 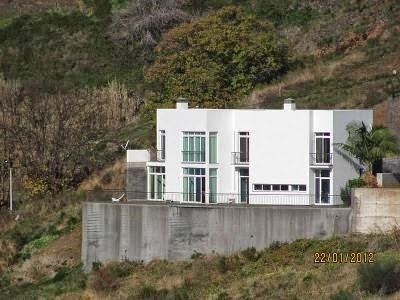 A photo taken by Gina, our new friend and property manager in Madeira, Portugal where we were living one year ago. The views of the ocean were exquisite. For more details, please click here. I loved 'the Descendants' too. I had forgotten it was Hawaii. Re Australia films after a night sleeping on it I have some suggestions, although they are not necessarily specific to Gold Coast. Muriel's Wedding with Toni Collette in her early days, looking very different than her recent appearance in the TV series 'Hostages' which I also really enjoyed. Of course I can't leave out the film 'Australia'. I have yet to see this but when released the reviews raved about the cinematography and the stunning scenery. I hope this helps. I have also asked my Australian friend for an insiders view- watch this space! Liz, thanks for these excellent suggestions. We've never seen "Australia" so that particularly will be a good movie to watch while we're there. We also watched "Hostages" and were disappointed it was canceled after only one season. We'll definitely look forward to these. Thanks, dear Liz, for keeping us updated on good movies and TV shows. We've loved the British TV shows you recently suggested and continue to watch episodes. What a great resource you are! Liz, please thank your Australian friend for the suggestion. I've put both of these movies in on my calendar to ensure we watch them during our time in Australia. You are such a fabulous resource for us! Thank you, so much, dear friend for all of your love and support which we also extend to you.